China is set to commence negotiations to create a 16-nation trade bloc, known as the Regional Comprehensive Economic Partnership (RCEP), which has recently been announced at the ASEAN summit in Phnom Penh that concluded in late November 2012. 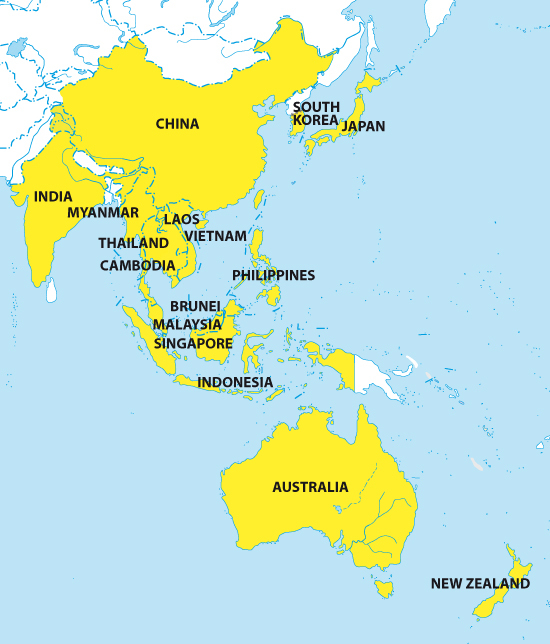 The RCEP will include the 10 members of the Association of Southeast Asian Nations (ASEAN) plus China, India, Japan, South Korea, Australia and New Zealand, and will have the effect of lowering trade barriers and custom duties across the region by the end of 2015. 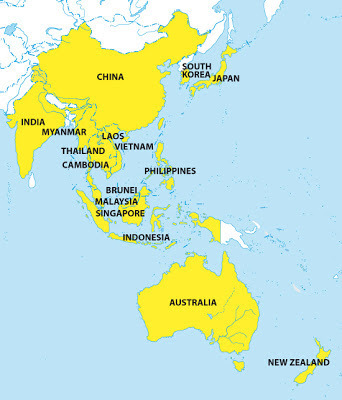 ASEAN includes Brunei, Cambodia, Indonesia, Laos, Malaysia, Myanmar, Philippines, Singapore, Thailand and Vietnam. In the Asia-Pacific region, economic alliance negotiations have mostly so far been conducted bilaterally.The six ASEAN partner countries, including China, Japan, Australia, India, South Korea and New Zealand, already have respective Free Trade Agreements (FTA) with the ASEAN nations. But the envisioned extensive FTA would be created by expanding the existing frameworks. The countries will beging to hold first-round talks with the aim of concluding the negotiations at the end of 2015. Nevertheless, this is not to say that the new FTA will be easily achieved, there are many challenging tasks to be accomplished before it can produce effective results. The OECD believes that within 50 years China and India will have become the major economic powers of the world. The organisation that brings together the 32 most industrialised countries of the world maintains that these two countries will account for almost half of the world's wealth in 2060. In a report entitled A Look at 2060: An overview of long-term growth, the OECD concluded that the global economy will grow at a rate of 3pc over the next 50 years. The OECD estimates that the current economic crisis will fade and the world economy will grow with consistency, but with a different pattern to the current. The Report identifies that emerging countries will behave with more vigor and growth, but gradually their evolution will slow and will go on to match the average of the current OECD countries. This uneven pace of economic growth will lead to a radical change in the world balance. The combined GDP of China and India will soon overtake the European economies and exceed that of all current members of the OECD in 2060. In 2060, China will have economic growth of 4pc and will increase its specific share of the global economy from 17pc to 28pc of the total. The euro area which now accounts for 17pc of the global economy, according to OECD projections in 50 years will only account for 9pc of the total. Furthermore, the US whose economy currently represents 23pc of the world economy will reduce its weight to 17pc in 2060. At the end of October 2012, Australia published a policy white paper that looks at its role of being a European country in the Asia-Pacific region. Australia has European cultural origins and other alignments which sometimes hamper its image in the Asia Pacific Region. But nevertheless it relies increasingly on Asian immigration, especially from China and India, to ensure its economy competitiveness and to meet the annual residence quota within its population policy. It has considerable security interests in its territory and maritime zones, but it only has a small population of 23 million. It is a US ally but it also has close economic and increasingly societal ties with China who has become its top trading partner in recent years. Interestingly, Qantas, its national airline, has just re-positioned itself as a new regional hub-and-spoke network airline to service the Asia-Pacific region. It has abandoned its flights to Europe choosing instead to enter into a partnership agreement with Emirates flying its customers to the Dubai hub where they will be able to connect to other destinations outside the Asia-Pacific Region. The Geo-Trade Blog will continue to follow closely how Australia continues to engage with the Asia-Pacific region and how it develops its strategic policy alignments with China and the US, particularly whether they will be governed by cultural affiliation with the US or by economic interests in the Asia Pacific Region.